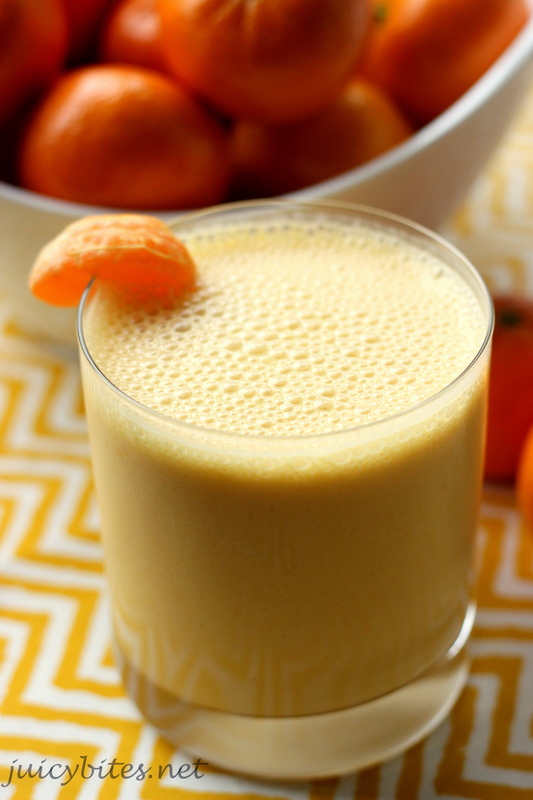 This smoothie tastes just like sunshine! It is sure to brighten your morning or perk up your afternoon. I seem to keep buying cuties (those yummy, sweet, small tangerines) every time I go to the market. I just love the way a bowl of cuties brightens up my kitchen. I also love to snack on them and so does my family. Unfortunately, we don’t always get through them all before they start to go bad. So…what do you do when you have too many cuties? Make a cutie smoothie, of course! These smoothies were sooooo good! 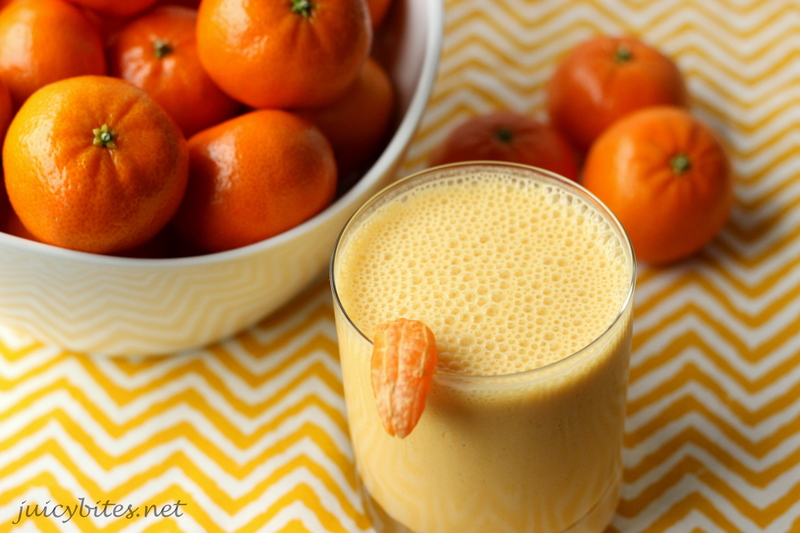 They remind me of an Orange Julius, only way better (and healthier). I made 2 versions of this smoothie, and decided to post both so you could pick the one you think you would like best. The one pictured is my fave and it’s the vegan version that was made with coconut milk. It was creamy and delicious and perfect for anyone avoiding dairy. I made the other version for my milk loving son and he loved it. Which ever one you try…I hope your family loves it as much as we did! Put all ingredients in a blender and blend until creamy. **For a creamier, richer smoothie use whole milk and full fat greek yogurt. If you freeze your yogurt in ice cube trays ahead of time, your smoothie will be even thicker and more shake like. 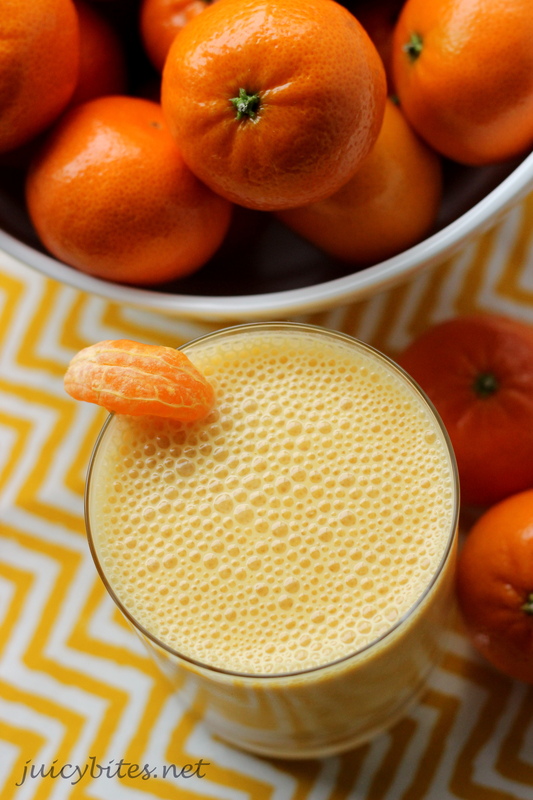 Another option is to peel and segment your tangerines and freeze them in advance for slushier smoothie. Adjust the honey to suit your taste. The plain greek yogurt is pretty tart so add more honey if you want a sweeter result. You can also use vanilla yogurt that is already sweetened and leave the honey out all together. Yum!! How would you change it up to incorporate vanilla protein powder? Might have to experiment! Protein powder would be great in it. Is the protein whey or soy? I would go with the first version and leave out the vanilla and the cashews. You can use dairy milk or non-dairy, whatever you prefer. I have some vanilla whey protein… I need to try it that way! Your smoothie looks and sounds so delicious! Thank you, Rosie! Just checked out your blog…Wow! What delicious looking goodies and beautiful photos! Can’t wait to try some of your recipes. After a long hot day my wife was asking me to go get her something refreshing to drink. Not wanting to leave the house I checked online and came across your cutie smoothie. I had everything in the house to make the vegan smoothie. I just made it and it is super yummy. Thank you! You’re welcome! So nice when you can easily whip up something delicious at home instead of going out for it. It’s also usually much healthier! Thanks so much for commenting!